Hello friends! Dwarka is one of the most important places for Hindu. It is an amazing place to see in India. It is one of the places to travel for pilgrimage. India has so much of intriguing ancient history. And then it has it's mythological stories and beliefs of many eras ago. There are so many places in India, which are believed to be from mythological eras and people see them as parts of their cultural and religious beliefs. Have you been to any such place? Apart from being religiously important, these places have many architectural masterpieces also depicting ancient history and arts of the bygone eras. 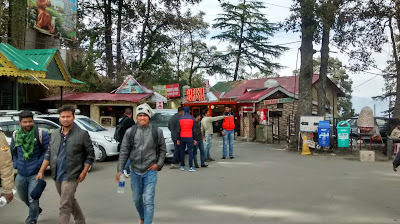 Places like Mathura, Varanasi, Rameshwaram, Mata Vaishno Devi Mandir etc. have huge devotional value for a large number of people in India. And then there are places, which are living proof of what happened centuries ago. 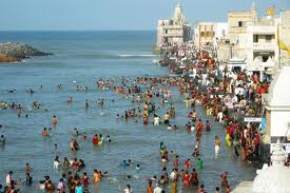 Dwarka is one such place whose history dates back to the era of Lord Krishna. 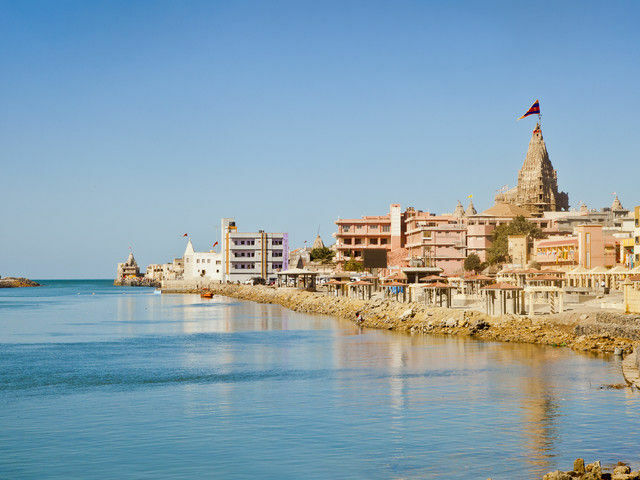 Dwarka, situated in Gujarat in western India, is an ancient city and is believed to be the one where Lord Krishna set up his kingdom after leaving Mathura. It is also said to be the first capital of Gujarat. Further, it is one of the four most sacred Hindu pilgrimage sites also known as Chardham. Dwarka is also one of the Saptpuris(or seven most ancient cities) of India. 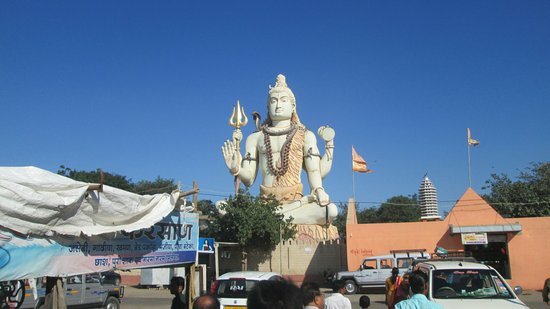 If you are looking to see most amazing places in India, you can't miss Dwarka. 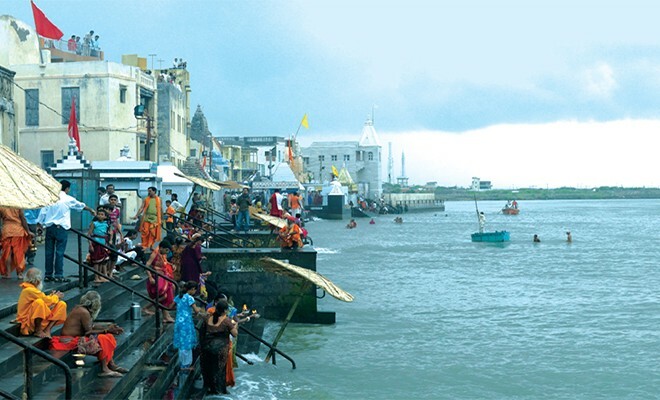 The ancient Dwarka of Lord Krishna was a gold city. There is a myth that after Krishna left earth, a big flood gulped whole city of gold and it submerged in the sea. However, of late this myth has got some credence with the efforts from Archaeological Survey of India, who have, during fresh excavations, found new evidence of the existence of Dwarka during the era of Lord Krishna. The word Dwarka means door to heaven. So once you enter the city, the pure and pious air of the city will enchant you. The spiritual atmosphere all around coupled with chants by devotees make it a holy city. 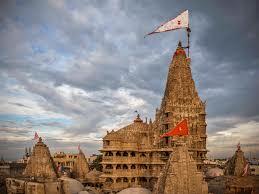 Apart from that, Dwarka has some of the most grand temples, which are architectural marvels in themselves. 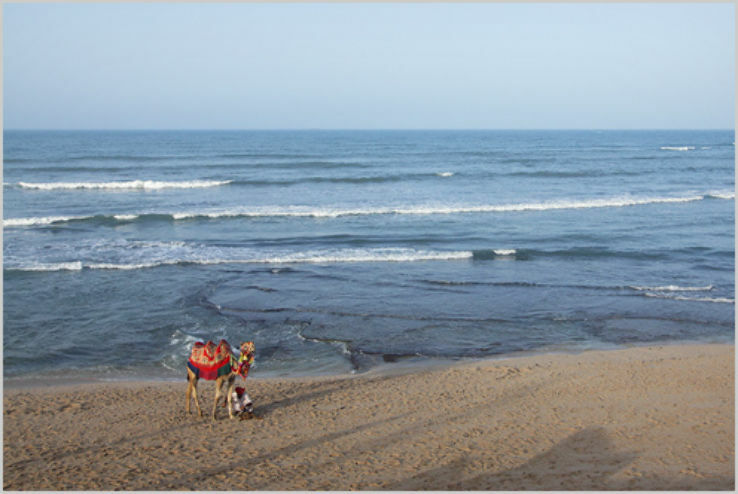 And in addition, there are beautiful beaches around town to relax and rejuvenate. 1. 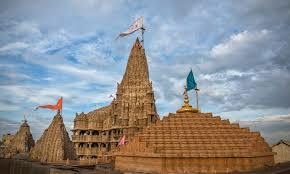 DWARKADHISH TEMPLE - The first thing you do on arrival at Dwarka is head stright to Dwarkadhish temple. This temple has a history of more than 5000 years and is believed to have been built by Vajranabh who was the great grandson of Shri Krishna. The temple stands proudly at the place where river Gomti meets Arabian sea. It is a towering structure with a Chalukya style architecture. The main shrine is five storied tall and is made of sand and limestone. The idol of Lord Krishna is in black color but is extremely attractive. The Bhavya(or huge) temple is situated at a height of 250 ft adorned by a 25 ft flag staff at the top. The towering Shikhara, built like a mountain peak, stands atop the Garbh Griha. 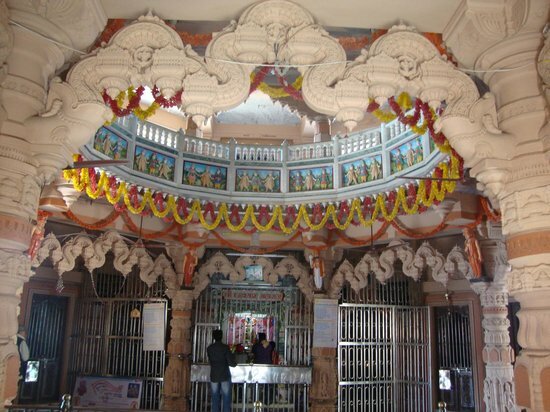 Within the temple, there are other shrines dedicated to Balaram, Rukamani, Subhadra, Revathy and many others. 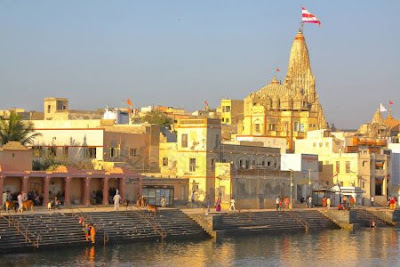 The festival of Janamashtami(birthday of Lord Krishna) is the most important festival in Dwarkadhish temple and is celebrated with much gusto. A large number of devotees throng the temple to celebrate the birth of Lord Krishna. Hues of colors adorn the town during this time. 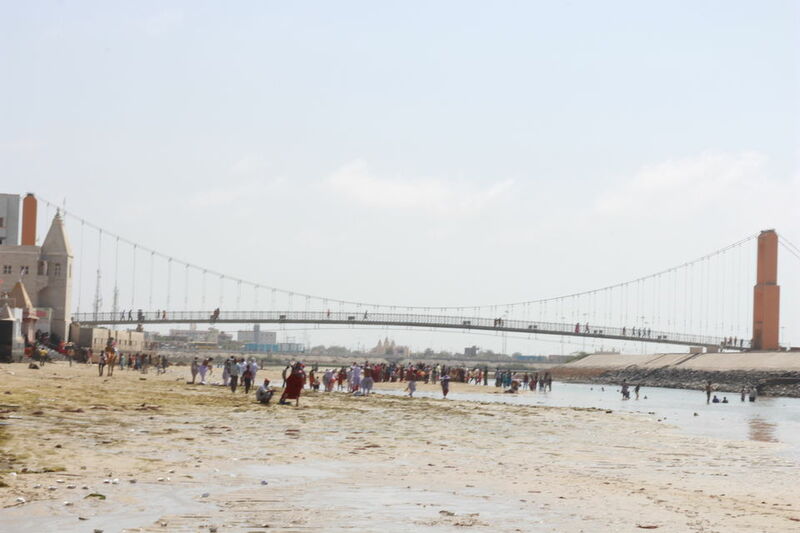 As a custom, devotees take a dip in the river Gomti before proceeding to Dwarkadhish temple. The flag changing ceremony in the temple is a treat to watch. Five times a day(thrice in the morning and twice in the evening), the flag at the top of the temple is changed. People in Dwarka come singing and dancing while bringing the flag to the temple and there is a huge cheer when the flag is changed. 2. 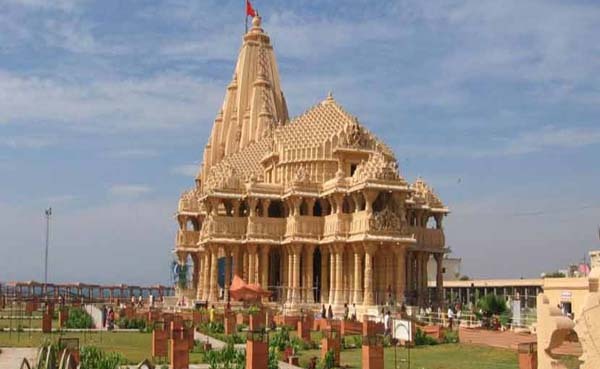 SWAMI NARAYAN MANDIR - Just close to Dwarkadhish temple is the Swami Narayan temple, situated near to the beautiful beach. 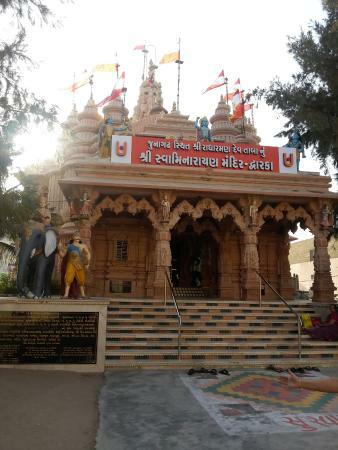 This temple is dedicated to Lord Swaminarayan, a reincarnation of Lord Vishnu. The best part of the temple is the spiritual vibes that you get ere. A very neat and clean temple, Swaminarayan temple is a very peaceful place. The beautiful architecture along with life like idols of Gods and Goddesses are truly eye catching. And the tranquil ambiance of the place gives a sense of true peace. When you visit the temple, it is sure to lift your spirits. The temple committee has a Dharamshala also, where you can stay. 3. GOMTI GHAT - Just behind Dwarkadhish temple, there is a beautiful view of river Gomti meeting Arabian sea. The devotees are tempted to take a dip in the river as it is believed that Gomti is none other than Ganges, the most sacred river in India. It is a thrilling sight to see a river bank and a beach at the same place. There is a bridge on river Gomti. 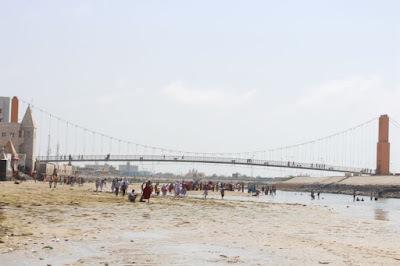 You just cross the bridge and walk across to Dwarka beach. There is camel ride available here for children. Devotees offer prayers at the Gomti Ghat. This a place which is not only significant from religious point of view, but it is a great attraction for nature lovers too. 4. 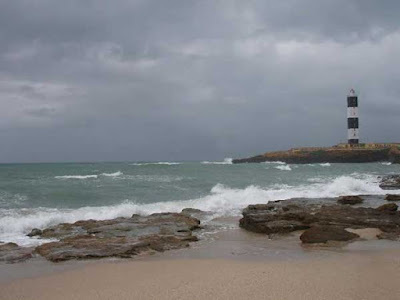 LIGHTHOUSE - The lighthouse at the beach is another treat to watch. The 43 m high structure is more than 50 years old(it was built in the year 1962) and gives a panoramic view. At sunset and sunrise, the lighthouse adds a mysticism to the surroundings. It's a great place to click pictures. 5. NAGESHWARA JYOTIRLINGA TEMPLE - This is one of the twelve Jyotirlingas or self existent temples. 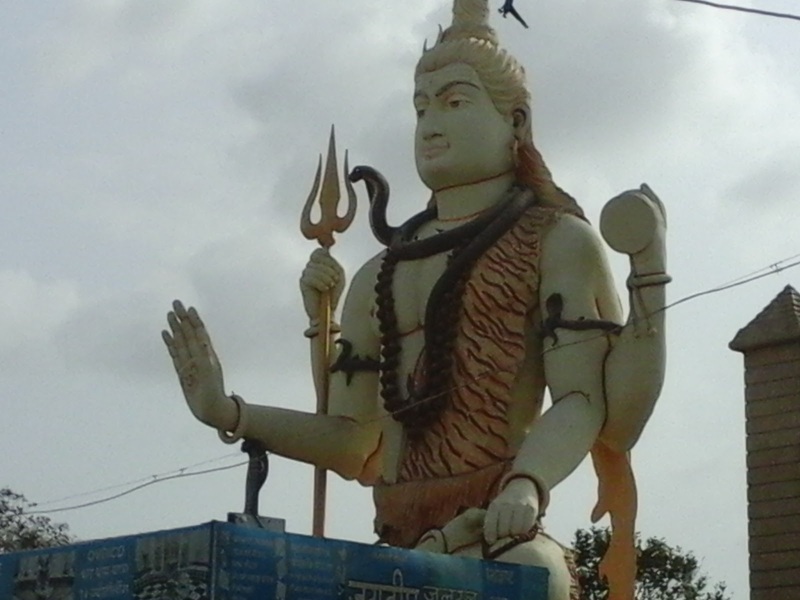 The huge statue of Lord Shiva is sure to mesmerize you. The statue is giant and artistically built. 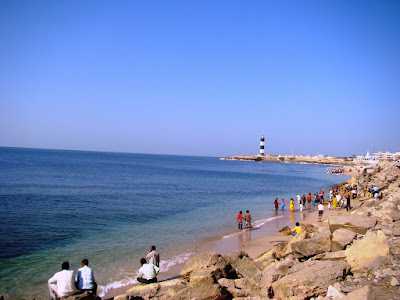 A nice and calm place, it is about 30 minutes drive from Dwarka. The experience of aarti in the temple is simply divine. The energy it releases is just amazing. The jyotirlinga is about 8-9 ft below ground level. You can have darshan from a distance and if you want to perform pooja, you have to go down 6-7 steps. On normal days, there is not much crowd so you can have easy darshan. Shivaratri is celebrated with great devotion here since the temple is one of the jyotirlingas. You can visit the Sudama Setu on Gomti river early morning to see beautiful sunrise at the confluence of the river and the sea. You have to buy a ticket to visit the bridge but the view of sunrise from here is sure to enthrall you. And then you can watch the sunset from the beach to get a stunning view. Probably, this is the only place, where you can see sunrise and sunset at the same point. AIR - The nearest airport is Jamnagar, which is about 130 km(81 mi) away. You can hire a taxi or get on to a state run bus from here to reach Dwarka. RAIL - Dwarka has it's own railway station and is well connected to all the major cities like Ahmedabad, Vadodara, Surat and Mumbai etc. ROAD - Dwarka is well connected to all the major cities by godd road network and you can get state run buses from there to reach Dwarka. 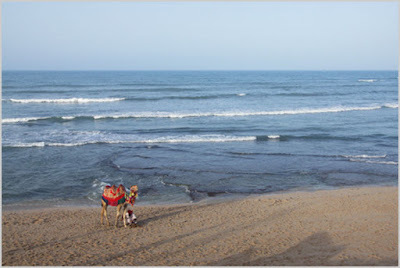 WHERE TO STAY - Dwarka has many hotels suiting all budgets. 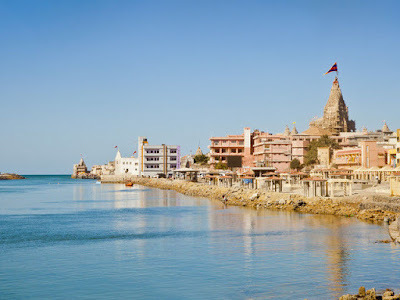 So whether you are a religious person or a lover of the art, a believer in mythology or a nature lover, Dwarka must be in your list of amazing places to see in India. 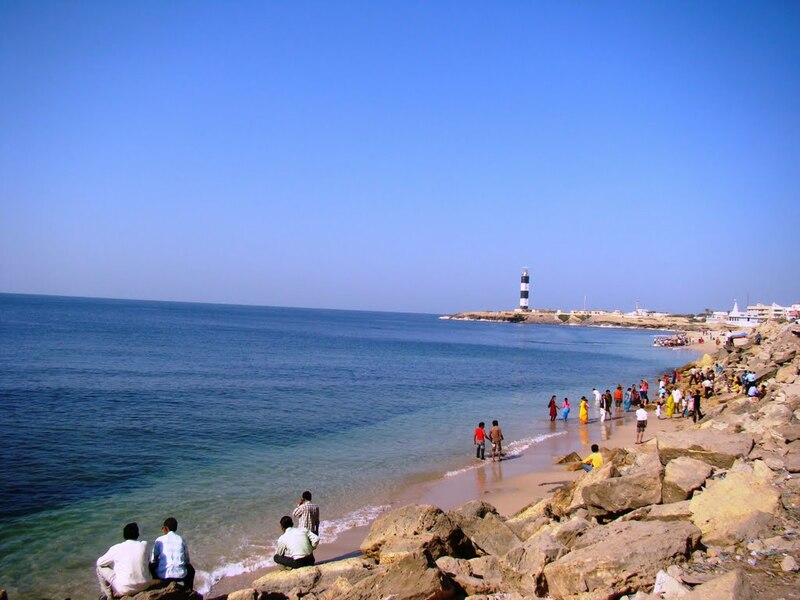 When are you visiting Dwarka? I am so far away from India but if I am ever in your beautiful country, I will be sure to visit the sites you have suggested. Thank you! Thanks Shirley. I assure you, visiting India is going to be a once in a life time experience. We would be very happy to host you. What a breathtaking place. The temples are all so lovely. The contrast of the very modern light house and the traditional temple architecture is very interesting. Thanks Gillian! These are really picturesque places which you would not want to miss. India is the next big place I need to visit. There is so much to learn and discover in India. 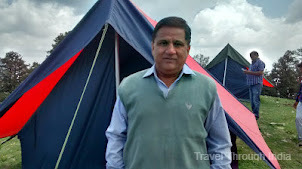 You must visit India John and experience it. It's an unbelievably beautiful country. Such a great blog - India has been one of those countries I’d like to visit but never truly spent much time looking into. This makes me want to go even more! Thanks Jo! Yes, India is truly a diverse and vibrant country. Do visit once. And do subscribe to my blog to keep getting more information about places in India. Thanks Alisha! India indeed is a gorgeous place. Do visit as it will be your once in a lifetime experience. Thanks Britt! Yes, India is a country of varied hues and a lot of diversity. Do visit once for an unforgettable experience.